The Crunch may be a new name, releasing their debut single earlier this year, but the members certainly aren’t new to the music scene. Singer Soren ‘Sulo’ Karlsson was the singer with Blues-rockers Diamond Dogs, Bassist Dave Tregunna was in Sham 69 and Lords of the new church, Terry Chimes was drummer for The Clash, and Guitarist Mick Geggus was part of the Cockney Rejects. That’s a pretty impressive lineup, and looking at the history of the members you can get a pretty good idea of what to expect from The Crunch. The music has a definite punk edge to it, but with plenty of rock influence too. The songs are very catchy, short and they all feature a strong chorus, so fans of bands such as The Clash, The Quireboys as well as fans of Diamond Dogs etc are all likely to find plenty here to enjoy. “Down by the border” was released earlier this year as the first single from the album – it’s a great song, but listening to the album it’s just one of many great songs all of which could easily have been released as a single. “A little bit of grace” features Idde Schultz guesting on vocals. Idde is the singer/guitarist with Swedish band Docenterna. THe song kicks off with a nice heavy guitar riff before the vocals join in. The song is a duet with both male and female vocals which works really well. The use of the female vocals ont his song does add an extra bit of variety to the album. “Runaway son” features Cockney Rejects singer Jeff Turner on lead vocals. 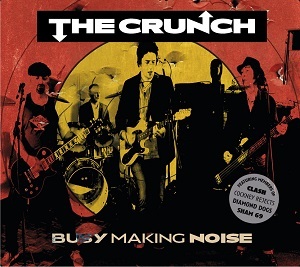 With their punk rock influenced sound, The Crunch stand out from the many bands with a retro sound as most of them have chosen a hard-rock sound. This album really is superb, packed with enough power, energy and enthusiasm to make it a really enjoyable addictive listen. I’ve listened to this album dozens of times already and will be listening to it a lot more as well.